How Can I Sell Refurbished Or Pre-Owned Cell Phones in RepairDesk via Trade-In Module? Repair businesses also get a significant amount of revenue by purchasing pre-owned or refurbished cell phones from customers and then re-selling them. To accommodate this activity, RepairDesk offers its users its very own Trade In module. With the help of this module you can buy cell phones from customers, re-sell them, manage inventory of trade in devices and manage leads who are interested in selling or buying such devices. We have introduced many new features in our latest version of this module. Previously you couldn't add multiple trade-in items in a single purchase and there was no option to transfer them to other store locations. Now however, you can add multiple trade-in items to a single trade-in purchase and transfer inventory to other store locations. 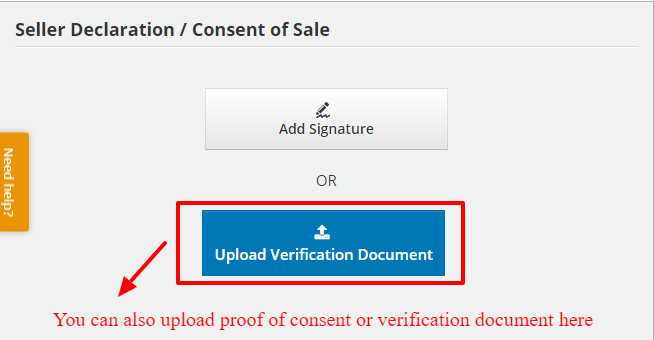 You can now also upload verification document for seller's consent. On top of that you can also create refurbishment tickets for trade-in items which need an internal repair (we'll discuss in detail later). - Make Trade-In Purchases. Buy pre-owned or refurbished cell phones and then re-sell them. - Transfer Trade-In items from one store location to another. Excited? Ok! Let's show you how to use Trade-In Module. 1. To access Trade-In section in RepairDesk, click on the Inventory tab on the header menu, click on Manage Inventory and select Trade-In from the drop-down menu. 2. You can alternately go to the Trade-In section by going to Inventory>> Manage Inventory >> Mobile, Accessories & Parts and then clicking on the Trade-In Tab. On the Trade-In page you can view a list of all of your Trade-In purchases. You can also search for a particular purchase via search filter and see the status of Trade-In items. We'll discuss them later in detail. To add a trade-in purchase, simply click on the Purchase button at the top-right corner of the screen. You will be taken to the Add New Trade-In Purchase screen. 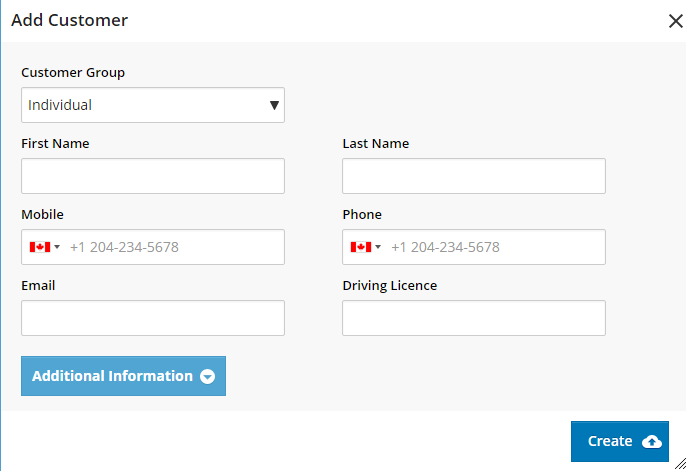 Here you can add buyer and seller details, add items to your purcahse, take seller's consent and enter payment info. Let's start with adding seller's details. You can select an exisitng seller from your database from the Search Customer search tab. To add a new seller and enter his/ her details, click on the New button. Customer Group - Mention if the seller belongs to a particular customer group. If the seller is acting in individual capacity select Individual from the Customer Group drop-down menu. Once you have entered all necessary details about the customer, click on Create button. After selecting or adding the seller, his/ her details will appear on the Trade-In purchase. After selecting seller from existing record of customers or adding a new one, you will be able to add notes against them. To add a note, simply click on Notes button as shown in the screen. You will also be able to see a log of previous notes against the customer and would also be able to add new ones. For more information on customer notes, please refer to this article. You can also select which employee was making the purchase. If you are logged in from your account, your name will be appearing. You can also select another employee from the drop-down menu titled Employee Making Purchase. You may be asked to enter employee's PIN number in case of someone other than you so that this purchase can be traced to the actual buyer. Select a purchase date from the corresponding field. You can select the date from the pop up calendar once you click on Set Purchase Date field. You can also mention how the purchase was made, either via Walk In or Mail In. Walk In - Seller physically came to your store and sold you the trade-in item(s). Mail In - Seller sent you the trade-in items via courier or mail. To add item(s) to your purchase, click on Add Line Item button (see attached screenshot). A pop-up screen will open, asking you for product and price related details for the item being added. IMEI/ Serial - Select from the drop-down option whether you want to enter the IMEI or Serial Number for the trade-in item. Once you have selected the option, enter the IMEI/ Serial in the adjacent text field. Color - Mention the color of the item/ device here. Condition - You can mention the physical condition of the trade-in item here such as Normal, Cracked, etc. Admin notes - If you want to add some additional notes about the item in question, you can post them here under Admin Notes. Now, to enter price related info, click on the Prices tab. You can enter Retail Price and Cost over here. Retail Price - Retail Price refers to the price at which you will be re-selling this item to your customers. Cost - Cost refers to the amount you have to pay to acquire this item/ device. The price you give to the seller, becomes your cost. Once you have entered all relevant information, click on Save button to add the trade-in item to your purchase. If you want to add other items to this trade-in purchase simply follow the above mentioned steps and another item(s) will be added to your purchase as well. You can add multiple items to your trade-in purchase. 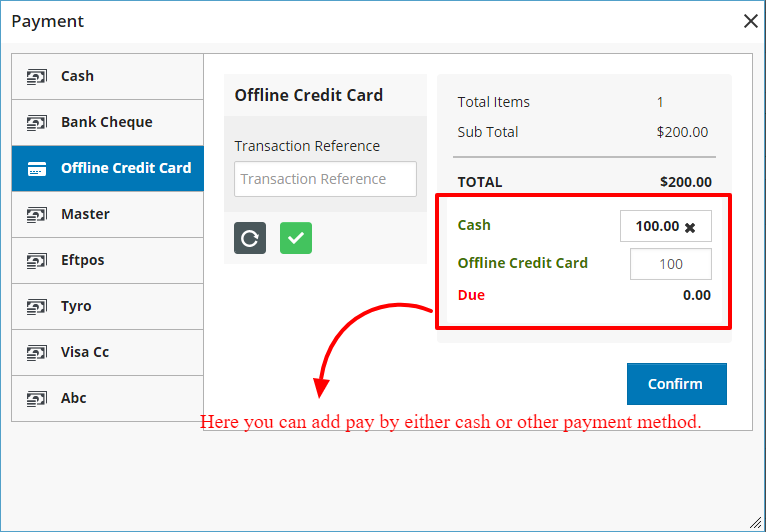 Payment Method - Select the method for payment such as Cash, Credit Card, Cheque etc. You can also add other information or noted regarding this trade-in transaction under Transaction Notes. It's important to record seller's consent for this transaction. You can record this consent in two ways: By taking seller's signatures or adding a verification document to your purchase as a proof of consent. 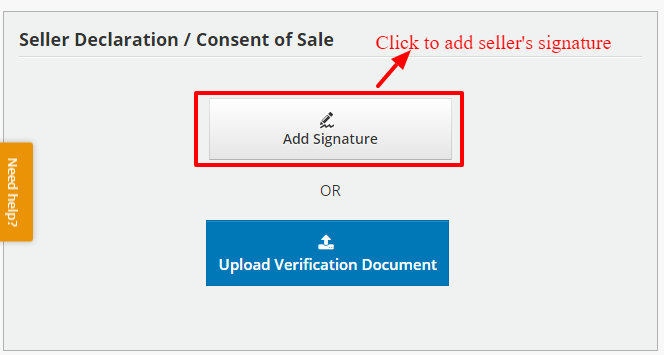 To take seller's signatures, click on Add Signature button. You will see a screen pop-up where items will be listed along with space for taking seller's signature. Once the customer has read terms of sale, has authorized the transaction and given his consent, he can enter his signatures under the Customer Signature area and enabling the check box: 'I accept terms and conditions'. Then simply click on Save to add signatures to the purchase. Alternately you can click on Upload Verification Document to upload a document which consists of declaration and approval of the seller regarding this transaction. Note: If you have already enabled Customer Approval Widget, it will take precedence over the signatures described above. If the widget is enabled, the order details and terms will be displayed to another screen which you have configured with the widget and on this screen customer can give his consent. Once all details regarding the purchase have been mentioned, you can either Save this purchase or confirm it by clicking on the Purchase button. If you save a purchase, the details of the purchase will be saved, however the stock of the items will not be updated. This option is useful if you still need some additional information regarding the purchase. You can always open a Saved purchase and then confirm it after which the stock of the related items will be updated. Once you have clicked on Purchase button, the trade-in transaction will be confirmed and the stock of relevant items will be automatically updated. clicking on purchase a new popup will appear where we can add split payment. sometimes it happens that you run short of Cash, in that case, you can pay by other payment methods like PayPal or bank cheque etc. Each trade-in purchase is automatically assigned a Transaction Reference number once the purchase has been confirmed. You can use this Transaction Reference number to keep track of your trade-in purchases and see which items were purchased under a particular trade-in purchase. Once a transaction is completed, you can print relevant receipts and labels. To print a thermal receipt as a record for the trade-in purchase between you and the seller click on Print Thermal Receipt. To print a service receipt click on the Print Receipt option. You can also print Barcode Labels for your purchased items by selecting the Print Barcode Labels option. Later on if you are re-selling a trade-in item all you need to do is to scan the barcode of the item on POS screen and it will be added to POS basket. If you have enabled Google Cloud Print or PrintNode for automatic printing, trade-in label and tradei-in receipt will be automatically printed once you complete a trade-in purcahse. Back on the main page of Trade-In section you can search for a particular trade-in purchase by taking advantage of our powerful Search Filter. Click on the Search Filter button to expand search parameters. Network - You can also search for a device by looking up network carrier. Condition - Display device with their physical condition such as new, normal, cracked etc. To Date - List down all trade-in devices or transactions till a specific date. After you have selected the Search Criteria, click on Search button to display relevant results. Status Graph: The graph helps you to keep a track of your trade-in items according to their current status. You can see how many devices/ items were sold, are in stock, transferred to another store, pending for refurbishment, brought by leads or which ones are pending for purchase. 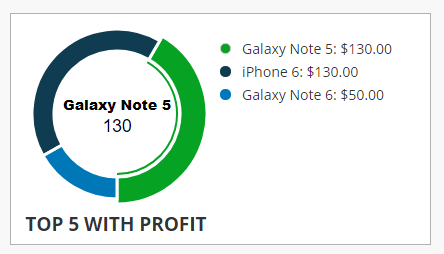 Top 5 with Profit: Another useful graph is the Top 5 Trade-In devices with Profit. This graph will show you five of your trade-in items which gave you the most profit after being re-sold to your customers. Purchased: Once you purchase the trade in device, trade in item will be recorded separately with status “In Stock. However you will be able to change it to purchase only if they don’t want to display it under stock to sell. In Stock: Once you purchase the trade in device, trade in item will be recorded separately with status “In Stock” and by default it will be visible on POS. Sold: Once item is sold its status will be changed to “Sold” automatically. RepairDesk would not allow changing the status of a trade-in item once it is sold unless it is refunded and would be back in inventory with the status of “In Stock”. Pending Refurbishment: If refurbishment is required on the ticket, you will be able to create a ticket and change the status to “Pending Refurb”. We'll discuss it it section XII. Transferred: Once a store transfers a trade in device to another store location, its status will be changed to “Transferred” automatically. However once another store receives the inventory, status of the same item will be “In Stock”. So there could be 2 different statuses on 2 stores for same item in case of trade in transfer. “Transferred” status on the store which will send the trade in device and “In Stock” or other status on another store which receives the trade in item. Once the item status is transferred, RepairDesk whould not allow changing the status. Lead: Once an inquiry comes to you via Buy Back widget. Status of the device will be changed to "Lead". Lost Lead: If the lead was not successfully converted, you can mark the status as “Lost Lead” for this trade-in device. We have added validations on some statuses which you can find in FAQs section below. 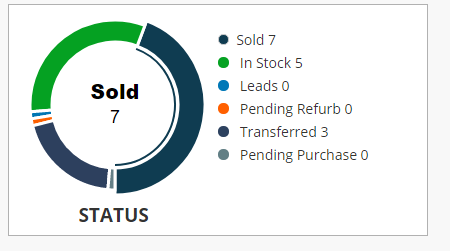 In Trade-In module you will get to see various status such as sold, purchases in stock etc.. One of these status is Pending Refurb. Pending Refurb refers to those trade-in item which you purchased are in stock, however they need to be refurbished before being re-sold to customer. Suppose you bought an iPhone 6 with cracked glass from a customer. Now before you re-sell it you would need to repair its screen. This internal repair can be tracked via Refurb Ticket. Set the status of such a trade-in device as Pending Refurb. Now, when you will open that item, you will be able to see an option "Create Refurbishment Ticket" under Prices tab. Click on it to create an internal ticket with zero price for the item which needs to be refurbished and click on Save button. Once a refurbished ticket has been created it will be created with its price set as zero by default. This is done because its an internal ticket and you are charging no one for this refurbishment. However, the cost of the repair item will be added to the overall cost of the Trade-In item. So suppose that the iPhone 6 with cracked glass cost you $500 and the refurb ticket used the part worth $25, then the amount fo $25 will be added under refurbishment cost and the total cost incurred to you for the purcahse of this item will be considered $525. Once a customer places an inquiry by using BuyBack Widget, the trade-in device item record will come up in RepairDesk account with a status of “lead” assigned to it. A transaction record will also be created with customer details and same item details. Users will be able to receive notification of the lead and once you open the link, the transaction record will open. It will allow you to complete the purchase. If the lead purchase is done, it will be considered as lead “Won”. Status of an item will change to “In Stock” from a lead. To transfer items to another store location, select the items from the Trade-In screen and click on the global Action button. Select the option 'Transfer selected Items'. Now the selected items will be added to a transfer order where you can specify destination store and quantity of the item to be transferred. You can access the details for all of your trade-in purchases, sales and details of these sales and purchases from the Trade-In Report. You can access this report by clicking on the Reports tab on the main menu, selecting the store from the Multi-Store Report and clicking on Trade-In report under the Sales Report section. To download the report, click on Download CSV/ PDF button on the top-right corner. The selected format will be downloaded to your system. IMEI /Serial: IMEI or Serial of the device. Here you can enter settings for Sellers and Buyers. Sale date - Select Sale Date from the drop-down menu. You can select the period after which sale will be considered to take place. Receipt Slogan - Any slogan which you want to be displayed on your Trade-In receipt will appear here. Terms & Conditions on Signature - Terms & Conditions which will be appearing on Signature area. Employee should enter access pin before Purchase - Enable this trigger to make it compulsory for employees ot enter their PIN before making a trade-in purchase. There is an organized admin history of each trade in item which will be displayed under each tab. It will allow admin/users to keep complete transparency of each trade in item. It includes information such as when and where the item was purchased, any and all transfers between stores, where it was sold and a link to the invoice no matter where the item was sold. If a customer purchases a trade in device but he wants to take refund and give the device back, Refunds functionality can be used to give customer refund and take back the device in stock. Once you give refunds to a customer there is option to Add Items back to inventory. When you will do it, Item will be added back with “In Stock” status. 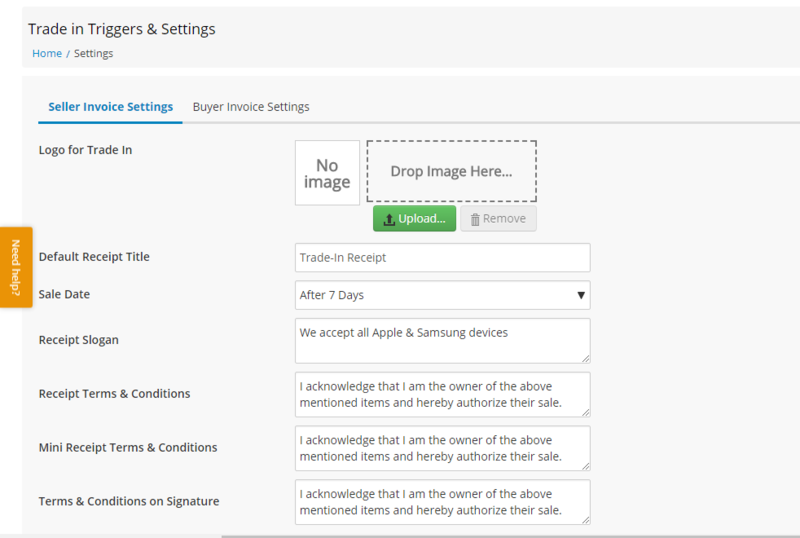 Buyer details will automatically remove from trade in record and Trade in report. 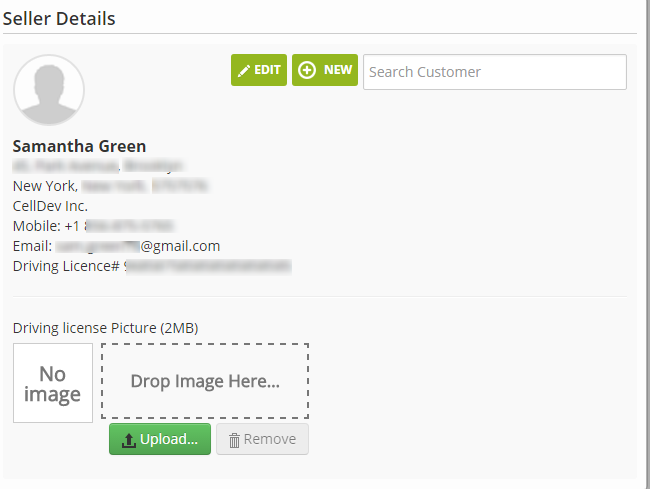 Admin/Users will be able to track first customer details and invoice from admin history. To know more about refunds, please click here. Note: Buyer details will come up if item is sold. If item is refund and back in stock. Last buyer details, transaction detail and sale value should be empty unless admin/users sell it again to another buyer. Q. Can I add multiple trade-in items simultaneously? A. Yes. Just click on Import Inventory button on the Trade-In section main screen. Click on Export Inventory to download a CSV file. You can then map data for devices which you want to add according to the format in the exported file. Once you have entered all the information and mapped it accordingly, save that CSV file and click on Import Invneotry option to import all these trade-in items. Once the import will be completed, all the devices in your file will be added to Trade-In section. Q. When will a trade-in item appear in Sales Report? A. A trade-in device or item will only be mentioned in the Sales Report once it is sold to a customer. So if a trade-in item is not sold to a customer, it will not appear under the Sales Report until the sales transaction is complete." Q. How to exchange a trade-in device with a new mobile/item? A. Normally people trade-in phones, like giving an old phone and getting a new one with some additional money.There is a simple workaroaund to exchange any phone or item with a trade-in device in RepairDesk. 1. Make a complete trade-in purchase transaction with cost price set as 0 (zero) because you need to exchange it further (exchange phone or item with a trade-in device). 2. Once the purchased item will be available for sale, you can set the retail price accordingly. 2: Add a Casual Item "Exchange Trade In Phone" with random price and add it in Transaction on POS. 3: Change the price of the casual item on runtime with the actual cost price while you are exchanging phone and make the quantity negative which will show that you are exchanging it. 4: Now add a phone or item in transaction. System will balance the amount you need to receive extra from customer in order to exchange the phone. Q. Can I pay the partial payment for trade In? A.No, partial payment is not allowed for trade in transaction. Q. How can I set up a label for trade In item? Q. What validations are placed on trade-in statuses? If the status of trade-in item is in stock, you will not be able to change its status other than scrapped for parts, but if it is already scrapped for parts, it will not be changeable and it will not appear on POS. Its status will only change when trade in is sold or if it’s added to refurbishment. In case of trade-in, when status is in stock, you cannot change its status to Sold. If the status is in stock then you can change status which are custom made or purchased. However it will not affect the functionality. Once you have changed the status to any custom status, it can only be changed back to in stock. If the status is set as purchased then you can change its status to in stock. Transferred status cannot be set manually, it is done after transfer transaction is carried out. If trade in lead is created from buy back widget than status shows Lead.You cannot change that status. once you proceed with its purchase, its status will be changed like wise to in stock if purchased. Once it’s in stock system will not allow to delete that item..
Lost lead status will not show once lead is created. Once that trade-in is purchased than lead lost option will show under status. Sold: Once that trade-in is sold, you cannot change its status, neither you could delete that item. If the status is pending refurbishment than you can only change it to in stock. On other status should be available if item is pending refurbish. Once the ticket is refurbished then it should automatically change its status from pending refurbish to in stock. If the trade in is pending purchase then its status should be changed only when purchase transaction is carried out against trade in. Manual change of status option should not be available at this point of time. If the status is set as purchased then system should allow user to change its status to in stock. In case trade is transferred then its status is not changeable. Transferred status cannot be set manually, it will be done after transfer transaction is carried out. There is no option to set this status. In case of lead you can access trade in detail from update trade-in by clicking item ID. It is allowed once it is purchased. When we click on item ID, it will open detail of that item. This action is restricted until purchase is done. Once the trade-in purchase is done, you can view trade-in item details. How do I manage repairs? How does the inventory section works? How To Add Multiple SKU's? How Can I Import Multiple Inventory Items in RepairDesk ? 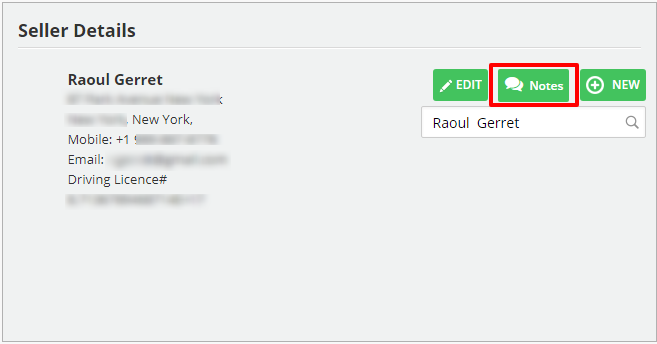 How To Enable Email Notifications for Items With Low Stock? How does the Inventory Count functionality work? How to charge tax on part cost or retail price only? How to edit inventory label template? How to transfer stock from one store location to another? How to search for any specific inventory item? How can I add a new item to inventory? How can I update or delete an inventory item? How can I export CSV file of existing inventory items? How can I generate and print Barcode for tangible inventory items? How can I assign tax to any inventory item? How can I upload pictures for inventory items? How can I show inventory item on POS? How can I view history of specific serialized inventory item? How to Auto generate SKU/UPC code ? How do i adjust inventory through Inventory Adjustment? What is Inventory Valuation and How it works in RepairDesk? How To Disable Auto Create Inventory Across Multi Store? How To Update Individual Item Price Across Multiple Stores?